Half (50%) of the public would say that if fewer people sign up for marketplace plans during this year’s open enrollment, it is mainly due to the Trump Administration, and most Americans (61%) see President Trump and Republicans as responsible for the Affordable Care Act’s future, the latest Kaiser Family Foundation poll finds. While the public generally sees Republicans as responsible for the nation’s health care system now, there are significant partisan differences in these perceptions. 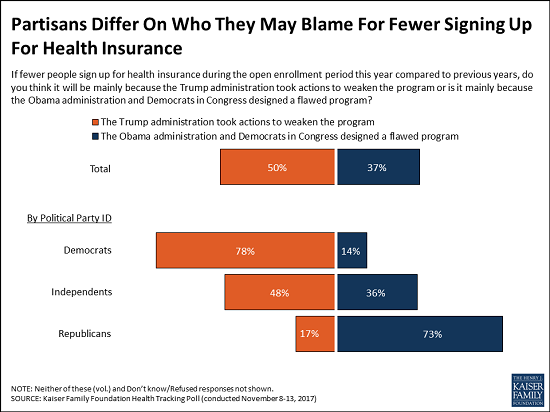 For example, most Democrats (78%) say that if fewer people enroll in marketplace plans this year, it would be because the Trump Administration took actions to weaken the marketplaces, while a similar majority of Republicans (73%) says that it would be because the Obama Administration and Democrats in Congress designed a flawed program. Independents are more likely to blame the Trump Administration’s actions (48%) than the Democrats’ flawed design (36%). Looking toward the future, a majority of the public (61%) – including most Democrats (71%) and independents (58%), and half of Republicans (52%) – say that because President Trump and Republicans in Congress are now in control of the government, they are responsible for any problems with the health care law moving forward. Fewer (27%), including nearly four in 10 Republicans (36%), say that President Obama and Democrats in Congress are responsible because they enacted the law. The public remains divided on its overall view of the Affordable Care Act, with similar shares holding favorable (50%) and unfavorable (46%) views. As in the past, these views largely fall along party lines. The poll also finds a huge partisan divide in how much people trust President Trump to do what’s best for health care in this country. Eight in 10 Republicans (82%) say they trust President Trump at least a fair amount. Fewer (42%) independents and a small share of Democrats (11%) say they trust President Trump. While attitudes towards the Affordable Care Act and trust in President Trump are largely shaped by party identification, opinions towards Medicare, the government health insurance program for adults 65 or older and for younger adults with long-term disabilities, are positive across partisan lines. Overall, a majority of the public (80%) – including most Democrats (85%), independents (83%), and Republicans (74%) hold favorable views towards Medicare. This month’s tracking poll also tests public support for two variations of a Medicare buy-in proposal put forward by some Democratic lawmakers: allowing some individuals under the age of 65 to buy into the Medicare program and allowing individuals between the ages of 50 and 64 to buy into the Medicare program. Seven in 10 of the public favors both proposals with a slightly larger share of the public favoring the proposal which limited a Medicare buy-in option to those between the ages of 50 and 64 years old (77% compared to 72%). This includes majorities of Democrats, independent and Republicans (72% who favor the buy-in for people between the ages of 50-65, 62% favoring a broader buy-in). Arguments for and against a Medicare buy-in proposal changes some minds, though no single argument pushes support below a majority.